What is Triton? Starting with the new Southern Mediterranean borders surveillance system, Cafebabel Brussels reports on migration. With a series of articles and interviews, we explore one of the most pressing issues of our time. Triton, the European Commission's new operation to 'manage migration' in the Central Mediterranean under the control of the Frontex agency, began on November 1st, 2014. Triton was officially conceived to support Mare Nostrum, the operation that employed Italian Military Marine forces in the rescue and assistance at sea of migrants leaving the coast of North Africa to try and reach Europe. Triton's area of operations expand across the Southern Mediterranean, including the Pelagie Islands (Lampedusa, Linosa and Lampione) and the inland coasts of Calabria. 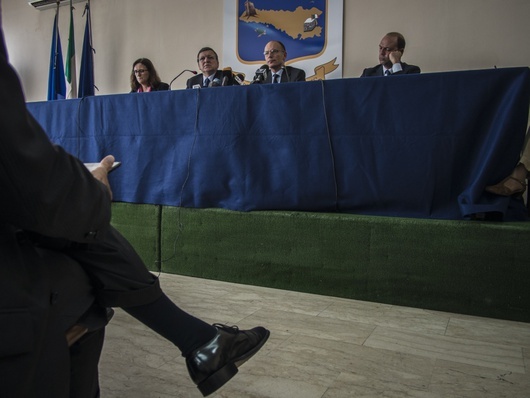 However, its activities will not venture beyond 30 nautical miles of the Italian coast, “beyond where Mare Nostrum had operated,” as Italian Interior Minister Angelino Alfano specified. The operation's primary function, according to Frontex, is 'border management.' Finland, Spain, Portugal, Iceland, Holland, Latvia, Malta and France have offered to provide equipment. That is only 8 countries out of the EU's 27 Member States. Specialised personnel, however, have been provided by 12 countries: Spain, France, Finland, Romania, Switzerland, Norway, Germany, Holland, Sweden, Portugal, Austria and Poland. As of now, the agency forsees a monthly employment of two high seas vessels, two ships, four patrol boats, two planes and a helicopter. Gil Arias, executive director of Frontex, has already asked Member States for greater technical support. EU Commissioner Cecilia Malmstrom, when announcing Triton on 7 October, confirmed that the operation was "tailored to the needs and requests of Italian authorities" and its objective is to reinforce border surveillance and support Mare Nostrum's humanitarian efforts. A week later, Minister Alfano gave notice that Mare Nostrum would shut down as of 1 November, in a progressive decomissioning process ending in January 2015. Efforts to rescue migrants at sea, which would have been reinforced and carried out with Triton, will therefore be diminished. The two operations, however were meant to be complementary, not alternatives to each other. Mare Nostrum was created after the 3 October 2013 incident where 366 Eritrean nationals died when their boat sunk close to the shores of Lampedusa. International public outrage, indignation and dissent over the deaths, together with then EU Commission President Barroso's willingness to put funds at the disposition of Italy, allowed for this initiative to be started. In Italy, numerous humanitarian organisations, among them Amnesty International, have decried Mare Nostrum's interruption. They have emphasised how essential its presence is on the coasts of the Mediterranean to safeguard migrants' lives and integrity - issues which aren't a priority for Triton. In reality, Mare Nostrum was supposed to work in conjunction with Hermes, a Frontex operation to counter sea-based immigration from Tunisia, Libya and Algeria to Italian shores, and Aeneas, which monitored the coasts of Puglia and Calabria in the Ionian Sea. Now, the mission to rescue at sea has been reduced to the EU's stated primary objective in terms of migration: protecting the borders. Border graveyards. What are the costs of protecting the borders? Hermes' first 40 days in 2011 cost European citizens 2.6 million euros. The monthly cost of Mare Nostrum was equal to 9 million euros, leading to a total of 114 million euros in only 2014, including an EU contribution of 1.8 million euros. It was essentially, purely an Italian economic effort. For Triton, Frontex's predicted contribution for 2014 is 5.8 million euros, with 2.9 million euros provided monthly for November and December. These monthly figures would amount to an annual cost of 35 million euros, without any rescue operations carried out in international waters, as was the case with Mare Nostrum. But these European costs account only for the Southern Mediterranean area. And what about the costs in terms of human lives to 'protect the borders?' For almost a decade, the EU has transformed its own borders, some of them in particular, into a big graveyard, according to Fortress Europe, a platform that has been monitoring deaths (and those lost) on the borders for years. The Sicily Canal is the area most affected, with direct voyages to Italy from Libya, Egypt, Tunisia, Malta. Similar fates await those migrating to Spain along the routes coming from Morocco, Algeria, Western Sahara, Mauritania and Senegal, heading to the Canary Islands or crossing the Strait of Gibralta. Extreme danger for migrants can also be found in the Aegean, travelling between Turkey and Greece, as well as from Egypt to Greece and Syria to Cyprus. Like in a Kafkaesque story, European Union governments are placing a series of barriers that make migrants' journeys more complicated and dangerous, while at the same time, they are scandalised if people risk their lives to overcome these barriers, often trying to just save themselves. Check out other pieces in Cafébabel Brussels' Migration Dossier and "Voices of Lampedusa", including on the EU's role in the conflicts that are causing migrants to seek refuge in Europe. 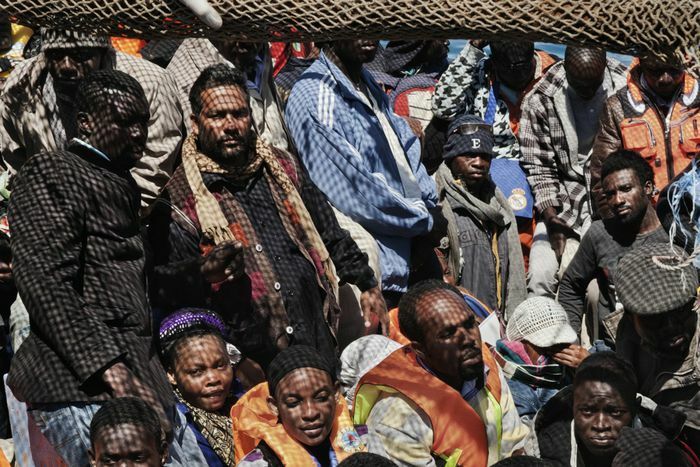 Translated from Da Mare Nostrum a Triton: Cosa cambia per i migranti?